How did I do for my very first month in the new year? At 16, Sadie Larcen is a normal homeschooled teenager until the night the police knock on her door to say they'd found her parents' van abandoned. 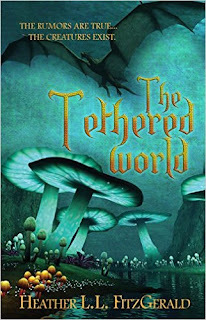 Sadie is not prepared for the family secret that they are charged with keeping the secrets of the Tethered World and now she and her siblings must venture into this strange land to rescue her parents. It took me a little bit to get the feel and rhythm of the book, but once I did, I got more and more excited about it. I really liked the characters and felt the tension of the adventure and suspense of what was going to happen. I was intrigued by Heather's conception of the origin of fantasy creatures like gnomes, trolls, dwarves, and etc. This book was unlike any I'd ever read and it was fresh and original. I'm looking forward to reading more about the Larcen family. I don't usually read fantasy books, but this one was great! I received a free copy of this book in order for me to review it. No other compensation was received and all thoughts and opinions are my own. Emily Van Arsdale is back in her home state to make her latest movie. She is used to having men adore her, but the one man who intrigues her, rafting guide Tracen Lake, doesn't seem to want to have anything to do with her. Tracen Lake is glad to have the money from coordinating the rafting scenes for the movie, but he isn't thrilled with having to deal with the high-maintenance Hollywood people. He's been burned by the allure of Hollywood before and doesn't need to repeat that heartache, but he is surprised that Emily is just a down to earth Idaho girl. Can they find love in Sun Valley, or will their separate lives keep them apart? 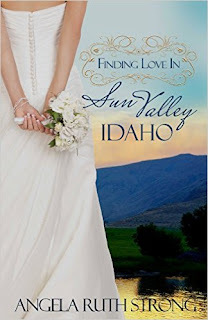 I enjoyed reading "Finding Love in Sun Valley, Idaho" by Angela Ruth Strong. I liked the characters in the book (both the main ones and secondary ones) and felt their pain as they struggled to discover how they were going to work things out. 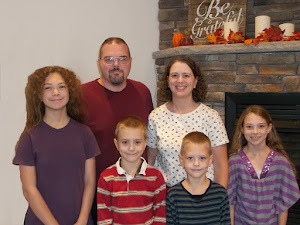 It was nice that they were normal people seeking God's direction for their lives. Things happened quickly in the book, but I didn't feel like it was rushed. I received a free copy of this book for me to write an honest review. No other compensation was received and a positive review was not required. All thoughts and opinions are my own. Book Review: "Best Hair Book Ever"
I have two daughters. One likes to do up her hair and the other is content to just leave it as is. I thought that this book would give them ideas of what they could do with their hair. 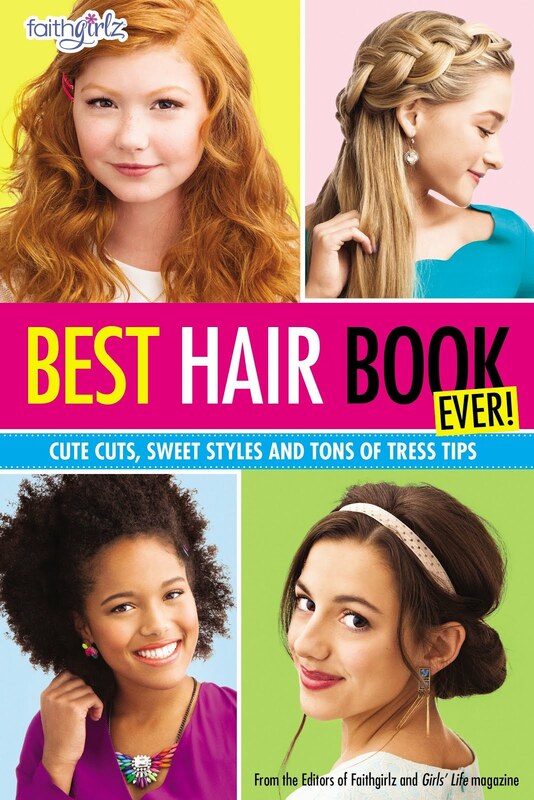 "Best Hair Book Ever" is from the editors of the Faithgirlz and Girls' Life magazines. I expected it to be just different hairstyles, but it is much more than that. The first chapter gives tips on identifying your hair type and how to best care for it. The second chapter talks about facial shape and the best cut to accent your shape. The rest of the book is divided into sections of types of hairstyles: School Hair, Summer Hair, Sporty Hair, Weekend Hair, Party Hair, and Braids. Each section gives five hairstyles with step by step instructions on how to achieve the look. Each chapter also gives a "Hair Candy" craft that you can make to use in your hair. I received a free copy of this book in order for me to review it. A positive review was not required and no other compensation was received. All thoughts and opinions are my own. My parents were going to get a different van, so we used our van as a trade in and bought their van from them. Our previous van didn't have power anything. I had to use the key to open the front door and reach around to unlock the side slider. We had to use the key to unlock the back lift gate and hand crank the windows. Lately, the rust was taking over and we had quite a few holes all the way through. This van is a Grand Caravan, so it's a tighter fit in the garage! 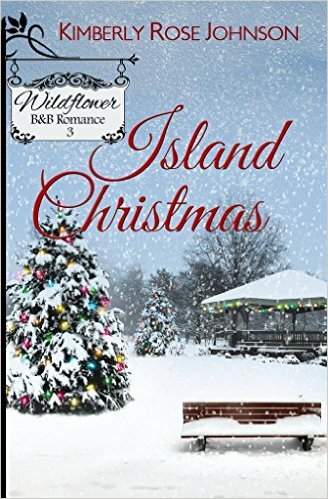 Rachel Narrelli comes to Wildflower Island to try and make a new start for herself and young son. Things are all smooth sailing and she is glad for her friendship with Chris Campbell. Will she be able to find where she fits? Chris Campbell finds himself drawn to Rachel, but with his family history of heart problems, can he risk getting involved with her? It was fun to be back on Wildflower Island for the 3rd book of the Wildflower B & B Romance series. Some of the previous characters show up again and it is best to read the books in order. I really liked that Chris was strong in his belief to not date Rachel while she was not a Christian. I also liked watching Rachel's journey to God. I received a free copy of this book for me to review. A positive review was not required and all thoughts and opinions are my own. Taylor Cabot has made a Survival list and has been checking things off as the 3rd anniversary of her husband's death approaches. Will she ever get to the point where she can check off the last item and move on with her life? 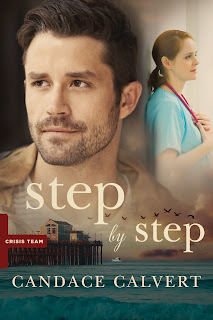 Seth Donovan comes to San Diego to train volunteers for the Crisis team, but also to see why Taylor is pulling back from her involvement in it. He is not ready for the feelings he has when he sees her again or the fact that she seems to be moving on with another man. I first "met" Taylor and Seth in "By Your Side" as their story starts as a side plot to the main story. It would be best, therefore, to read the books in order. You get little reminders of that book and the novella "The Recipe" during "Step by Step". I really liked Taylor and Seth and wanted to shake Taylor for the way it seemed she was headed. Besides the main story characters, the book also follows Kasie Beckett and Sloane Wilder, two other employees in the San Diego Hope ER. Sloane's story will continue in the next book in the series. There is a spiritual thread woven through the story and the characters seek God's guidance for their lives. I received a free copy of this book in exchange for my honest review. All thoughts and opinions are my own and I did not get any other form of compensation. Jimmy Westbrook built a wedding chapel for his love, Colette Greer, but when she left for New York, it stood empty and unused. Will Jimmy find what he's been searching for? Taylor Branson's whirlwind romance and elopement were not what she expected. Now things aren't going so smoothly. Is her marriage doomed like so many others in her family? When Taylor takes a photography assignment back in their hometown, long held secrets are brought to light. Can this special place bring peace? 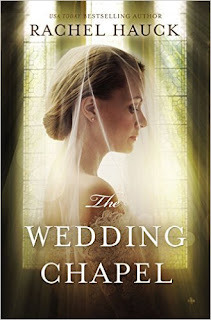 I have read books by Rachel Hauck in the past and enjoyed them, but when I read the blurb for "The Wedding Chapel", I decided to pass on reading it. I'm not that into the "already married, but need to work on our marriage" story line. However, a group I belong to, The Fiction Guild" sent me this book to review. There is a lot to keep track of in the book with it following Jimmy, Colette, Taylor, and Jack, as well as flipping back and forth between the past and the present. I found the characters to be interesting and I wanted to know what was the deal with why everyone was acting the way that they were. I found myself frustrated and angry over the secrets and lies that had so completely altered peoples lives which shows the book was well written, I guess. It made me almost glad that I had finished the book and to know the secrets were finally revealed. There is a Christian message throughout the book, but the characters didn't live very Christian lives with many of them having "been" with people they weren't married to. It didn't give details, just that they had done it in the past. I understand that sometimes Christian people mess up and do things they shouldn't, but I rather like pure heroes and heroines. I actually guessed at the biggest secret in the book about halfway through the book and just had to wait to see I was right. I received a free copy of this book in order for me to review it and give my honest opinion. All thoughts and opinions are my own and no other compensation was received. Veronica Fisher's life is shattered when her best friend and fiance, Seth Lapp, is killed in an accident at work. She finds her mammi's forgotten recipes and opens a bake stand to sell her raspberry pies. When a customer starts coming regularly to buy her pies, she finds herself feeling a connection with him. Jason Huyard seeks out Seth's fiancee to offer his condolences. He doesn't expect to feel so attracted to her and finds himself falling in love with her. He knows he needs to tell her that he was there the day that Seth died, but he's afraid that he'll loose her. I really enjoyed reading "The Forgotten Recipe" by Amy Clipston. 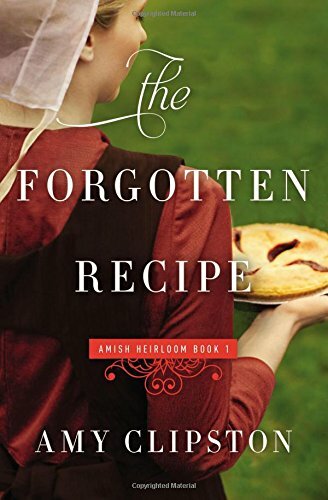 It is the first book in the "An Amish Heirloom Novel" Series. It was easy to connect with the characters and feel like they were friends. 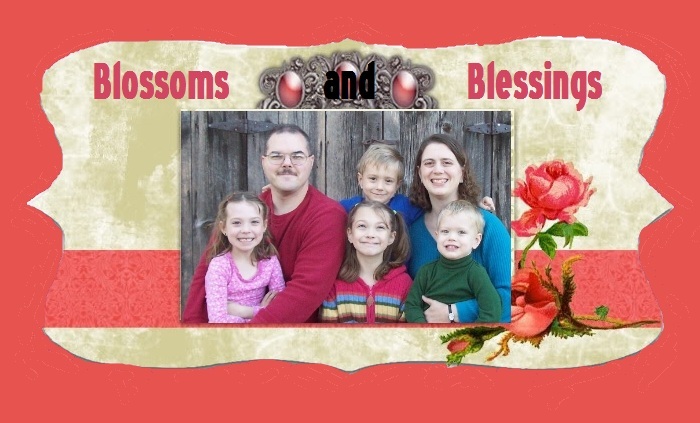 The book flowed easily and the characters desired to follow God's plan for their lives. I look forward to reading the next book in the series so I can find out what is going on between Veronica's sister Rachel and her boyfriend and also about the mystery surrounding the hope chest in the attic. I received a free copy of this book for me to give my honest review. All thoughts and opinions are my own and no other compensation was received. Our church had a pinewood derby race, their first ever. The four kids had fun getting their cars ready. Emily's car was almost an ounce over the limit. I drilled out and shaved off wood and it didn't make any difference in the weight! Finally, we got out a belt sander and shaved off the bottom of the block of wood. We painted the cars and Emi's car was overweight AGAIN! So we drilled 4 holes in the bottom with a spade bit. They had four categories: Primary (K-2), Junior (3-5), Teen (6-8), Adult (9th grade and over). Andy didn't get any awards which was pretty distressing for him. He was actually the 3rd fastest car in his category, but since he was in the fast heat, he got eliminated and the winning car from the slow heat (Which barely made it down the track) got 3rd place. Emily gave him one of her 2nd place ribbons. 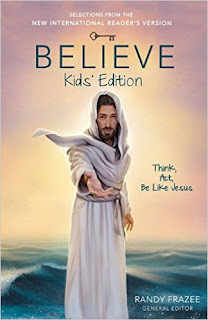 Book Review: "Believe: Kids Edition"
"Believe: Kids' Edition" is edited by Randy Frazee. It is divided into three sections, each with ten chapters. "Act" is about the key practices of the Christian life and ask the question, "What should I do?" Included are: Worship, Prayer, Bible Study, Single-Mindedness, Total Surrender, Biblical Community, Spiritual Gifts, Offering My Time, Giving My Resources, and Sharing My Faith. "Be" is about the key virtues of the Christian life and ask the question, "Who am I becoming?" Included are: Love, Joy, Peace, Self-Control, Hope, Patience, Kindness/Goodness, Faithfulness, Gentleness, and Humility. Each chapter opens with a Key Question, Key Idea, and Key Verse. This is followed by a "Think About it" section and an Introduction. Throughout the chapter, core truths are shown in blue ink to make them stand out. Each chapter is finished with Discussion Questions. At the very end of the book there is a list of the Bible excerpts used in each chapter. I think that this book is a good springboard to get children to studying and understanding the Bible and what it means to be a Christian. I received a free copy of this book from the zblogsquad in order to give my honest opinion. No other compensation was received and all thoughts and opinions are my own. "Goodnight Manger" by Laura Sassi is a cute story for children. It has an interesting font that is big enough for children to read. Some of the words are larger for effect. 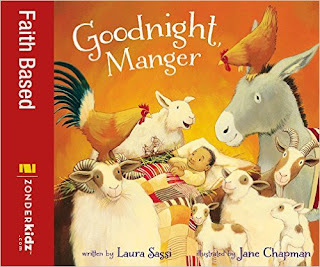 The book is interesting as it doesn't follow the "Away in a manger no crying He made" line. In this story, Jesus is having a difficult time falling asleep and the animals and visitors try to get Him to fall asleep. I liked the angels being portrayed as men having a party in the sky celebrating Jesus' birth. The pictures are bright and colorful and easily engage the child in the book. One thing I didn't like was the "Three kings" showing up at the same time as the shepherds as they didn't come for awhile after Jesus was born. I received a free copy of this book from the zblogsquad in order to give my honest review. All thoughts and opinions are my own and a positive review was not required. 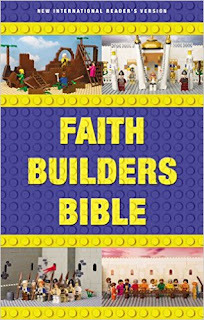 Book Review: "Faith Builders Bible"
The "Faith Builders Bible" is a New International Reader's Version meant for children aged 6-10. This version is a simplified version of the regular NIV Bible. Other than the 12 double sided full color pages that feature Lego-type creations to portray Bible stories, this Bible is rather plain. The Bible itself has no special features other than a dictionary and a list of "Great Bible Stories". The full color pages topics include: Noah Builds an Ark, Animals 2 x 2, Building the Tower of Babel, The Ten Commandments, Building the Tabernacle, Solomon Builds God's Temple, Bringing Down Jericho, Samson's Demolition, David Defeats Goliath, Psalm 23: A Psalm of David, Jesus is Born, Feeding a Crowd, A Change of Heart (Zacchaeus), Jesus Walks on Water, The Last Supper, Jesus and the Cross, The Lord's Prayer, The ABCs of Salvation, The Fruit of the Building With a Strong Foundation, a presentation page, Building with the Books of the Bible, and Can You Build.... 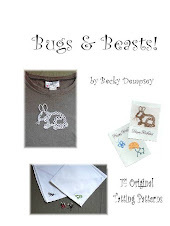 These pages give a brief overview of the story and a "Building Block Verse" to go along with it. My sons like LEGO bricks so I thought this would be a cute Bible for them. The full color pages are cute, but overall, this Bible is not what I expected and I was disappointed in it. I was given a free copy of this Bible by the zblogsquad in order for me to give an honest review. All thoughts and opinions are my own and I was not compensated in any way. Heidi Wetzel struggles to find some normalcy after her husband's U-boat sinks. She goes to the country to help take care of refugee children. Not a fan of the National Socialist Party, she tries to think what she can do to passively resist. Is she ready for the role God has for her to play? Paul Braedel learns during flight school that his wife has died. After his bereavement leave, he joins a navigator training class, but lacks the zest for life he used to have. He has a hard time feeling close to God, but when he is forced to parachute from his plane, he hears God. "Find Heidi" He sets off to find his wife's best friend from when they were in high school. Will he be able to make it back to safety? I really enjoyed reading "Friends and Enemies" by Terri Wangard and am happy to see that there are two more books in the series. I liked Heidi and Paul and followed them with interest as they worked through their difficulties and grew and changed. I had to wait until the midway point of the book before their stories intersected (other than flash backs to high school). I liked how it showed what life was like for the civilians in Germany during WWII and how not all of the Germans were pleased with what their government was doing. I also really liked their reliance on God, even when life was difficult. It was interesting to read about the B-17s. I didn't realize that they changed planes from mission to mission. I thought that they were assigned a plane and always flew it. I also didn't realize all that went into the missions and that they even had navigators. 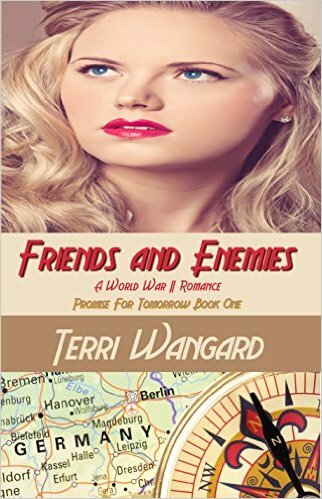 The amount of research and details that Terri Wangard put into the book was excellent. I was provided a free copy of this book in order for me to give an honest review. All thoughts and opinions are my own and a positive review was not required. How did I do on my goals for 2015? I did pretty well until July and then I sort of fell off the face of the world and didn't do much. I'm not really sure what happened, but I just hit a wall or something. So some things I did more, some I did less, and some I did what I hoped for.